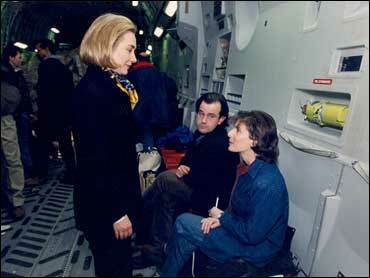 That's me talking to the first lady on a military cargo plane on our trip to war-torn Bosnia in 1996. Back in 1996 I was assigned to travel with the First Lady on her trip to Bosnia, Greece, Turkey and Italy. Bosnia was the first stop. We spent nine hours there, arriving on a military cargo plane and moving around within the country on giant Chinook helicopters. Sen. Hillary Clinton gave an account of our arrival in Bosnia during a speech last Monday at George Washington University in Washington, D.C., saying she remembers "landing under sniper fire" and that conditions on the ground were too dangerous for a planned arrival ceremony. "There was supposed to be some kind of a greeting ceremony at the airport," Clinton said. "But instead we just ran with our heads down to get into the vehicles to get to our base." Due to the possibility of sniper fire, our pilots used what we were told are "assault take-offs and landings." In short, the climb and descent are very fast, and very steep to minimize exposure to hostile fire on the ground. It's exciting and frightening and, in the midst of it all, wearing our helmets and bulletproof vests, it's easy to imagine we may be narrowly escaping enemy bullets. In reality, we had no known incidents of enemy fire on our aircraft. Mindful of the fact that we were with the First Lady, and that she was venturing farther inside Bosnia than her husband the President had ever gone, reporters kept a close eye to the crowds and never entirely went off-guard. However, the mood upon first landing at the Tuzla airport was light. Children were there on the tarmac to greet the first lady, Chelsea was by her side, Bosnian dignitaries had gathered: It felt safe. Later, Mrs. Clinton and her party ventured further into the country via military helicopter, landing at one of the former frontlines of the war, Camp Alicia. According to my notes of the event, the First Lady and Chelsea deboarded without incident and made their way down a line of American soldiers, thanking them for their service. They climbed a lookout tower, were shown a mine-sweeping machine, and talked to a number of soldiers. They shared jokes with the troops, ate a meal there and then moved onto another Camp: Camp Bedrock. Mrs. Clinton and Chelsea walk off the plane and were taken to visit M*A*S*H patients nearby. To be sure, it was not the "safest" trip for a First Lady to take: there were serious risks in traveling to Bosnia, even for the President's wife under the vigilant protection of the U.S. military. It took some guts for her to go. But I don't recall, and did not note, any close calls on this trip with sniper fire or any other dangers. Update: In a conference call with reporters this afternoon, Clinton spokesman Howard Wolfson answered questions about Clinton's assertions, allowing that it is possible she "misspoke." Wolfson: "The facts are clear from contemporaneous news accounts that she was entering a potentially dangerous situation. She has written about this before, she has talked about this before and there you have it. Now, is it possible that in the most recent instance in which she discussed this that she misspoke, with regards to the exit from the plane, but there's no question that I hope everyone is clear about this in the reporting, there is no question if you look at these contemporaneous accounts that she was going to a potential combat zone, that it was by the front lines and the first person since Eleanore Roosevelt to do that and she was going into a hostile military environment."